School photography, as most people think of it, is one of the few styles of photography that has largely remained the same since its inception. 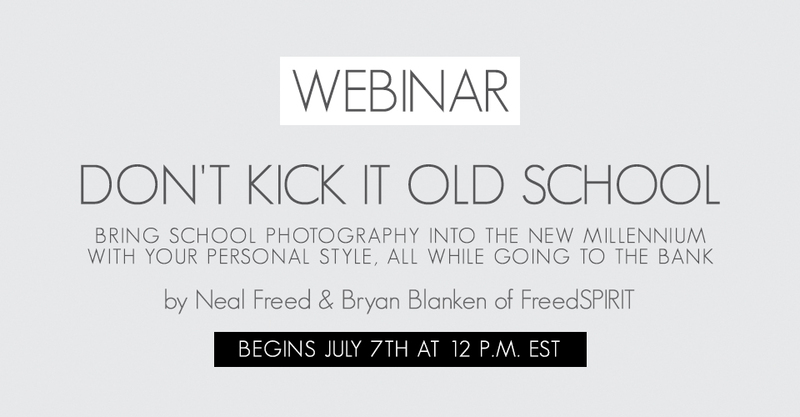 We’ve teamed up with renowned photographer Neal Freed for a free webinar series to discuss how you can reimagine school photography, increase sales, improve your workflow and more. This five-part series begins July 7th at noon EST with a new episode airing each Thursday. If you’re unable to attend, we will also have the episodes available to stream. Looking forward to learning new ideas! Looking forward to a new perspective ! Thank you! Looking forward to it!! I just closed two new school contracts this week and am looking forward to this very timely course!! Thank you for streaming the classes, due to having in-studio appointments on those days. We can’t wait to learn some new ideas to boost our sales. Hi, I missed some of the first one, where can we see the rest of it? Hi Sadie, we will be sending a follow-up email with the link to the first webinar! I had an event come up and had to miss it. Will you make the recording available? I heard it was great. Was really looking forward to the webinar but had an appt that conflicted with it. Where can I see a recording of it? Hi Gary, we will be providing a link to the recording. We are finishing up some editing, then we will email it out to you all! Hi Carolyn, we will be providing a link to the recording. We are finishing up some editing, then we will email it out to you all! Please send me link to school photography links. I need to break it up because its to chatty, but there are bits of info I need to hear. Hi Gene, I have emailed you the link! Thank you I miss the 1st class, how can I see it again. I would love Thursdays link too pretty please. I had a sales session and couldn’t reschedule. Of course our internet crashed 5 minutes into the second webinar. Will a recorded link be provided in the future? Thanks! Yes, we are working on the recording now. You can come back here to find it, but you’ll also receive an email with it! Hi Denise, we are working on the recording for the second episode now! Hi Brother Jaye, if you click the link for the first episode you’ll be able to watch it. Thanks! Hi Amanda, we are working on the recording of the second episode now. You can also view the first one at the link above. Thanks! There’s no recording for the last one? — the packages and products one? I neeeeeed to see it, please! Hi Carolyn, the video is now posted above. You beat us to the punch!